At this time we are not offering any hand carved signs or barrel heads. Custom Wine Barrel Carvings are the ultimate wine gift. Wine barrel carving is a dying art form. Once a popular way to decorate breweries, wine cellars, tasting rooms and barrel rooms, today there are only a handful of wood carvers keeping this old world tradition of hand carved wine art alive. Because it is a dying art, your custom carved wine barrel commission instantly joins an exclusive class of treasured wine art that will be admired by generations to come. What will you have carved on your barrel head? From a personalized wine cellar or tasting room sign, to a company logo, family crest, wine label, portrait, or even a scenic view of your home or favorite winery, each creation becomes a unique, one-of-a-kind work of wine art. Custom wine barrel carvings are the perfect way to commemorate an event, honor a vintner, and decorate your home, office, wine cellar, tasting room, barrel room, brewery, reception area, bar or restaurant. A single barrel head can require as many as 60 to 80 hours to hand carve. This does not include preparation of the barrel head or finish work. Depending upon the detail involved, pricing for most of Tom's barrel head carvings range between $1000 and $2,500. Designs can be painted, adding color while allowing the natural wood grains to show through, or finished in stains. You can request either finish, or allow Tom to make the decision based on the design. 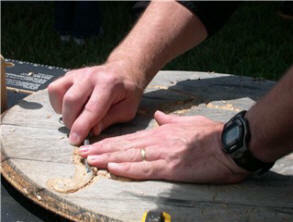 How to order a custom wine barrel head carving... it starts with YOU! You must picture what you would like to see carved into the solid oak, to be enjoyed by you, your friends and family, your guests and of course, generations to come. Then, You must e-mail Tom. If you have a logo, family crest, wine label or picture of your intended design, we will create the layout for the barrel head at no charge. Should you need Tom to create the design, our barrel design services start at $500.00 which must be paid in advance before any work is done. 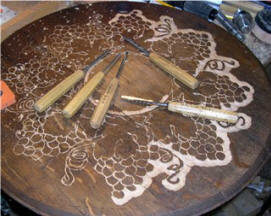 When the carving is commissioned, this fee is applied toward the final cost of the barrel. Once Tom has created the design layout, a picture will be e-mailed to you for final approval. The e-mail will also contain a quote on the cost of the project (based on the projected hours of carving) and an estimated completion date. The design must be approved and a 50% deposit must be made before any carving work begins. All custom orders are taken on a first come, first served basis. Your deposit holds your place on our shop schedule. A barrel head requires 4 to 6 weeks from preparation of the head to the finishing phase. Please note that Tom is usually booked two to three months in advance, meaning your barrel head may take three to four months from deposit to delivery. When your barrel head is finished, Tom will contact you with the final price. Your final price will NEVER be higher than the project quote! All of Tom's quotes include a margin of safety, so chances are good, unless a design creates an unexpected problem, your final price will actually be less. Once the balance, taxes (if any) and shipping is paid, your barrel head will be on the way! If you have any questions on our policies, please go to our Order Information page. If you still have questions, please e-mail us. Tom looks forward to working with your ideas, adding his own artistic touches and creating a truly unique heirloom that will be more valuable than your initial investment. Not sure what you want on your custom carving? Visit our Wine Barrel Carving Gallery to get some ideas!